The wig canvas head is made of cork. It is easy to use multiple times. This mannequin head is designed for hair experts . You could put pins and hold wigs easily. 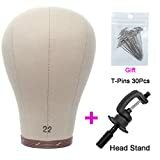 It is suitable for all kinds of wig head stand. Please contact us ,if you need stand. The size of this head is suitable for 20inch---24inch，pls buy a model head that fits your size. Please allow 0.1--0.3 inch size tolerance.